At their talks in Tokyo on May 31 during President Quang’s State visit to Japan, the leaders noted with pleasure pragmatic and rapid developments of the Vietnam-Japan relationship across fields, with many similarities in strategic interests. They agreed that 2018 will begin a new development phase of the bilateral ties. PM Abe described President Quang’s visit as a very important political event in the Vietnam-Japan relationship. He said Japan highly values Vietnam’s socio-economic achievements as well as its increasingly important position and role in the region and the world at large. “Japan attaches great importance to Vietnam in its foreign policy,” the host emphasised. He appreciated the country’s effective cooperation and support for Vietnam in various realms. Host and guest consented to continue to enhance mutual political trust by maintaining high-level visits and meetings, and intensifying cooperation and exchanges between the two parties and legislative bodies. They also agreed to beef up economic links in the spirit of mutual benefits, increase Japan’s investments in Vietnam and join hands in major projects on high-quality infrastructure, energy, personnel training and climate change response, as well as in implementing Vietnam’s industrialisation strategy. The two sides will work together in order to raise bilateral trade revenue and facilitate the entry of Vietnamese seafood and fruits like litchi and longan into the Japanese market. PM Sinzo Abe affirmed that Japan will continue supporting Vietnam in socio-economic development by providing official development assistance (ODA), strengthening cooperation in high quality infrastructure projects, and committing the provision of 16 billion JPY (142 million USD) in ODA for a project to enhance vocational training capacity of Vietnam. President Tran Dai Quang hailed contributions of Japanese ODA to Vietnam’s socio-economic development and the improvement of the country’s competitiveness. He agreed that the two countries need to coordinate closely in using the resource. Both sides concurred to foster affiliation in security and defence as well as in implementing the declaration on joint vision in defence cooperation between the two countries. They will bolster cooperation in various areas such as cyber security, defence equipment, military medicine, UN peace-keeping operations, war consequence settlement through landmine clearance and support of Agent Orange/dioxin victims in Vietnam, improve the capacity of law enforcement at sea, and share experience on maritime policy. The leaders lauded the launch of negotiations for an agreement on mutual criminal legal support and another on transfer of sentenced persons. 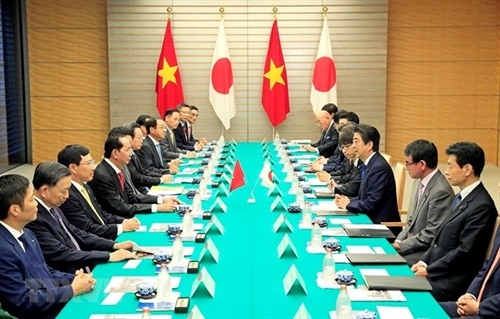 Vietnam and Japan agreed to promote coordination in education, human resources training, agriculture, health care, labour, urban building and development, administrative reform, and partnership among localities. PM Shinzo Abe pledged to assist Vietnam in high-ranking official training, administrative reform, while continuing receiving apprentices from Vietnam. They stressed that this is an important foundation for sustainable development of the Vietnam-Japan relations in the future. President Quang asserted Vietnam’s consistent policy of actively coordinating with international partners, contributing to maintaining peace, stability and cooperation in the region and the world. The two sides agreed to enhance their coordination at global and regional forums in the issues of their common concern. Talking about the Korean Peninsula issue, the leaders affirmed the support for efforts for peace, stability and denuclearization in the peninsula, and stressed the importance to resolve disagreements by diplomatic and peaceful measures. Regarding the East Sea issue, the two sides agreed on the importance to ensure peace, security, navigation and aviation freedom and safety in the sea, and the peaceful settlement of disputes by peaceful means without the use of force or threat to use force, exercising self-restraint and avoiding all actions that would harm trust, and strictly abiding by international law, especially the 1982 UN Convention on the Law of the Sea (UNCLOS). They also underlined the need to respect diplomatic and legal processes, fully implement the Declaration on the Conduct of Parties in the East Sea (DOC), and strive to reach a framework of a Code of Conduct in the East Sea (COC) in a practical and effective manner with legal effectiveness. At the end of the talks, President Tran Dai Quang and PM Shinzo Abe witnessed the signing of four documents between the two countries’ ministries and sectors. The documents include a diplomatic note on a non-refundable aid worth 745 million JPY (equivalent to 6.77 million USD) for human resources development scholarships; a diplomatic note on a non-refundable aid worth 1.96 billion JPY (equivalent to 17.8 million USD) for the upgrade of downgraded water drainage ditches in Ho Chi Minh City; a memorandum of understanding on cooperation in land and water resource management, measurement, mapping and information on geographical space, hydro-metrology and remote sensing between the Ministry of Natural Resources and Environment of Vietnam and the Ministry of Land, Infrastructure, Transport and Tourism of Japan; and the minutes on cooperation on urban construction and development in the 2018-2021 between Vietnam’s Ministry of Construction and Japan’s Ministry of Land, Infrastructure, Transport and Tourism. On the occasion, the two sides adopted the joint statement on the State visit to Japan of the President of the Socialist Republic of Vietnam.